Flicker Alley brings out a classic. A new Blu-ray outlet that is truly a classic in itself. One of the finest jobs ever done in my viewpoint in allowing this brilliant piece of cinema to reflect to a new generation of film lovers, in a flawless new restoration. This is a 1924 French Silent Classic, also known as The Inhuman Woman. It’s a one of kind film that stands out even today. I dare say Masterpiece for its ultimate beauty and story. It’s a visual experience that leads the one watching into a tightly directed visionary reality, that is one of kind. This is a mix of drama with science fiction. This film is filled with experimental film techniques that is both eye opening and way before it’s time. This is directed by Marcel L’Herbier. He was a French film maker that was beyond his time in creating memorable pieces of cinema, that stand out, and still are truly remarkable achievements for the time period. Simply put, he was a masterpiece director that masterly envisioned stories to screen, that left lasting emotional marks on the watcher. He was a pure avant-garde brilliance of imaginative means that shine off screen. His work is some of the best out there. In his long career, under his belt he directed well over 50 productions. From Silent films, documentaries, TV Movies, feature films, shorts. He wrote, directed, produced, acted, edited, he was a pioneer of film making. One of the greatest visionary’s in cinema. A soul that knew what he wanted to display. He envisioned mastery, and achieved that mastery through many of his works, and L’InHumaine is one of those works. Your main character is a singer named Claire Lescot. She is famous and many men court her. She loves the attention, plays off the attention, and also plays around and taunts them. Through this process one of the young men named Einar Norsen kills himself because of Lescot's toying, and coldness toward his affection. After his death she shows no emotion or care. Soon she finds people turning on her because of her coldness at the death of Norsen. One night she adventures to the grave of where Norsen is buried. There she lets down her guard and freely explains her love for him. How she always loved him. To her surprise Norsen is not dead. It was not true. Another man named Djorah is angry and has jealous of this new reality in that Lescot’s professed love, and now new relationship. And so he causes Lescot to be bitten by a snake, poisonous. She dies. But Norsen is a scientist and through his experimentation's he strives to bring Lescot back to life. Your main lead of Lescot is played by the beautiful, multi-talented Georgette Leblanc. She was a true gift to the entertainment world. She was a French Opera Soprano, author and yes actress. She was a truly gifted entertainer that was a one of kind persona that left the world with many fine examples of perfection both through cinema, music, and writing. On an interesting note Georgette was friends with the director Marcel, and had approached him with the idea to make a film starring her. Also starring the brilliant Jaque Catelain as Einor Norsen. Like Georgette, he too was friends with the director. Catelain was a major Silent Film actor. He went on to act in the talkies also, but his fame was during the silent era of film. Working in over 20 silent films. He was one of those performers that seemed to own the emotional roller coaster of facial expressions, body movements that displayed the proper reaction one needs to display the right effect in a silent film, in that the audience watching understood the emotional plight of the characters. He made you experience what was happening to that character on screen. He was a genius in my viewpoint and shinned in this film L’Inhumaine. This drama mystery mixed with the elements of fantasy is a prime example of a classic film that stands the test of time, and should be watched, studied and expressed to all generations of film lovers. Thankfully Flicker Alley has honored this film on a truly one of kind, lovely new outlet. A solid perfected Blu-ray that is pure gold for any lover of cinema. A fine example of how to treat an older film. This is a whole new outlet expressed with a mastery, crafted with beauty, displayed, and given an expertise, and ultimate love affair for film. Now what majorly needs to be talked about is the awesome flawless restoration that has gone into this film. Lobster Films along with Marie-Ange L’Herbier, French CNC, SACEM, Maison Hermès all contributed to bringing this old film into a new light of perfection. A 4K resolution. This film looks gorgeous. An utter treat to a film lover. Pure eye candy through imagery, pristine and clear. Next one has to mention the audio music. Displayed flawlessly also. The music is in two different ways. The first being by Aidje Tafial and the second by the Alloy Orchestra. The crystal clear sound. Crisp. Solid perfection as one listens. Both audio and video has never looked any better on this classic film. “Behind the Scenes of L’Inhumaine”: This is a great watch. Filled with great information on the film. Any movie buff will absolutely love this feature. Runs about 15 minutes. A great 15 minutes to educate yourself on this fine film. “About the Recording of Aidje Tafial’s Music”: Really loved this program, specifically because I love music, film scores are one of my favorite realities to music. Music sometimes makes a movie, expresses a movie, and gives a movie a beating heart. In Silent films the music was the golden ticket. Silent Films had to have the soundtrack to make the film flow with an ease to demonstrate emotional reactions and ordeals happening. The music done for this feature is a moving, emotional, clarity that is demonstrated with a high class expertise. You also get a booklet. This is a fantastic read and also filled with photographs of the feature film and the behind the scenes reality of the production. A perfect added bonus. Flicker Alley is one of the greatest companies honoring and bringing out flawless pieces of cinema. They pay great respect to film. They showcase the brilliance and importance of protecting and giving new outlets to amazing cinema pieces forgotten by time. Their presentations are by far some of the greatest examples of how to express, and treat the art form of motion picture. 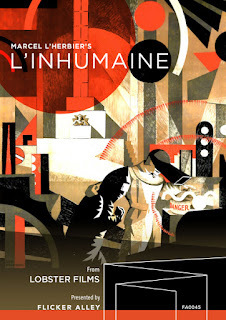 L’Inhumaine is a prime example of that beauty. This blu-ray is a must own experience. Any movie lover, movie buff, movie historian, guru of film, should have this in their collection. It should be displayed with love, care. A flawless blu-ray. Highly Recommended.